You’ve heard it before. No communication should ever leave your office without a call to action. 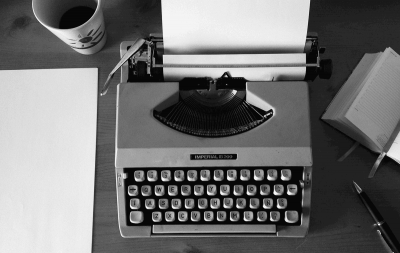 Every page… every email… even your Facebook posts… need one. What does that mean? It means you need a game plan that details the path customers should take as they move through your funnel. You need to be crystal clear about what action you want people at each stage of that journey. And you need to tell them plainly what it is. The call to action is, quite simply, your invitation for people to respond. With one caveat. In most cases, you won’t actually ask for a sale. Don’t get me wrong. You do want to drive sales. But sometimes, you simply want to push people to the next step in the sales process, not rush them to checkout. And largely, this decision depends on the channel where your message appears. Your call will range from indirect to direct, from asking for time to asking for money. To help make it clear, let’s look at sample calls to action in social media, content, emails, ads and landing pages, so you have a good framework for crafting appropriate and effective calls to action that improve your bottom-line results. 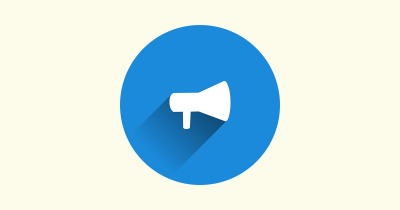 You’ve probably heard the mandate that social media posts should have a call to action (CTA). But it’s important to realize that a CTA in social channels is far different from what you’re used to seeing on a sales page. People follow you on Facebook, Twitter or Google+ to keep up with your brand. (Well, maybe to get special offers.) They want relationship, not a stream of hard-sell offers. So how do you make a call to action without turning people off? Indirectly, of course. They aren’t demanding, and they don’t even mention a sale. Instead, they’re friendly. They tease… offer valuable information… and invite readership. In social media, focus on relationship first, sales last. Promote content or special offers by posting a short description or teaser, followed by a link. 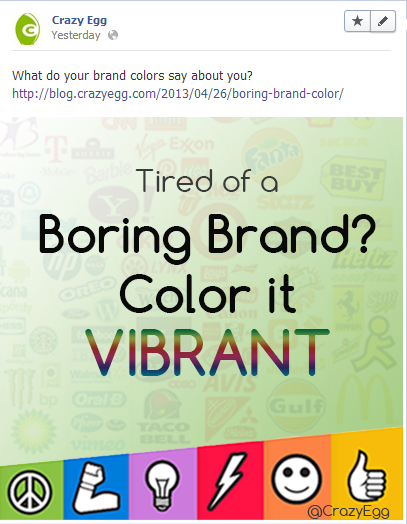 One trick for increasing engagement is to create a graphic for your content. Upload the image, then put a teaser and link in the description. But remember, not all posts need to include a link. You can also share tips and useful information, or post funny pictures or cartoons. The point is to make relationship your goal, and save hard selling for other channels. Content can be a little more direct than social media, but you still want to avoid a hard sell. Think about how people find your content, and you’ll understand why. The majority of your blog traffic probably comes from search engines or social media. People do a keyword search because they’re looking for information. They respond to a social media post because it looks interesting. If, once they click through, they find a low-value article that doesn’t meet their expectations, it looks too much like a bait and switch. They won’t trust you… or want to buy from you. You must give people what you promise, and in most cases, that means no sales pitch. Which is why content usually provides no more than an indirect push towards the sale. Where appropriate, you may link to a sales page or invite people to learn more. You may also have ads on the page. But the content itself should provide value to your readers: entertainment or useful, actionable information. How do you create a CTA with this no-sales mandate? 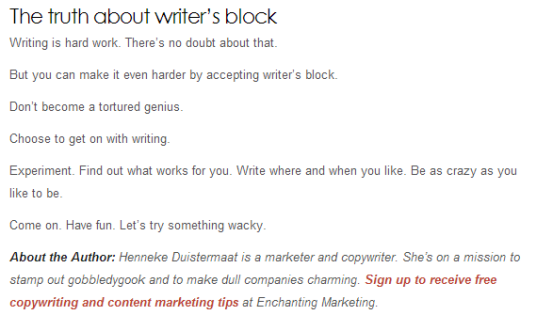 Let’s look at how Henneke Duistermaat does it in one of her articles. This post doesn’t drive sales or even ask for a click-through. Its sole purpose is to help readers become better writers by giving them solutions to writer’s block. There’s no link and no product promotion. And that’s good. Because readers of this blog don’t want to be sold. They want to become better bloggers. Like Henneke’s article, this one doesn’t ask for the sale. Instead, it asks for engagement, which often leads to brand loyalty, which ultimately ends in a sale. What action do you want people to take after reading your content? It could be a comment or a social share. It could also be one task that would help readers apply the information in your article. Make that your CTA. Then pose one or two questions at the end of your post to get people thinking — and encourage them to post their answer in the comments. Calls to action in email are much more direct than in social media and content. With email, you usually want to drive traffic to your website. So you need a compelling headline and a strong CTA. This email from GlassDoor does it well. Notice that each element could be considered a call to action. It’s phrased as a command, is compelling and specific. That ensures that no matter what readers focus on, they’ll be compelled to click through. Don’t leave any doubt in your readers’ minds. Tell them exactly what you want them to do. In your emails, as in this example, don’t worry about a big warm-up or lengthy product description. Tell them how they’ll benefit if they do what you say. Then tell them to do it. Here’s where CTAs take on the direct response, hard-sell style we’ve come to expect. In advertising and sales pages, your task is to drive sales. So your call to action should be direct and compelling. But no matter where you click on the ad, you end up on the sales page. Each command is, in essence, a call to action. And if any of them appeal to you, your click will get you to the sales copy. It’s the same with sales pages, except here, you have the space to lay out your offer and make a separate call to action. 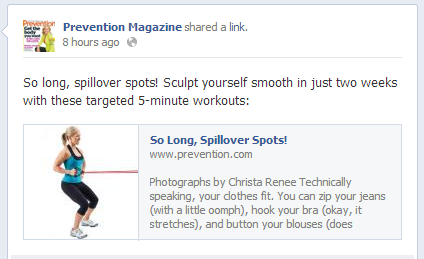 Here’s how Prevention does it in its Zumba® Fitness promotion. The offer is presented with a benefits-oriented subhead that makes exercise sound fun. Then it describes everything you get with purchase, using words such as “bonus,” “exclusive,” “full body-shaping system” to add value. It’s enough to get you drooling. On your landing page, treat your offer and call to action as two separate elements. Your offer needs to spell out everything people get when they respond. It should overcome objections and make the product absolutely irresistible. As in the email, when you finally give your call to action, make it concise and clear. And don’t get too fancy. All you have to do is ask for the sale. 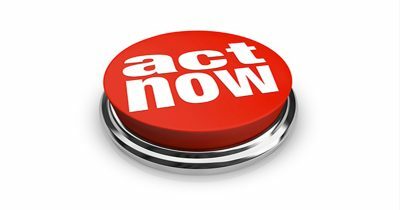 The phrase, call to action, generally brings to mind a loud-mouth infomercial pitchman screaming Buy Now! But if you’re active in social media and content marketing, that’s not the most accurate description. Sure, you need a call to action. But the action you request won’t necessarily be to buy. More often than not, you’ll ask people to click a button, read more, or watch a video before you ever get to the sales pitch. It’s okay, though. Indirect CTAs still drive action that can lead to a sale, especially if the action deepens relationship or builds brand loyalty. Focus on making an appropriate call to action for each channel, and you’ll drive action that appeals to your followers… and will ultimately lead to the sale. 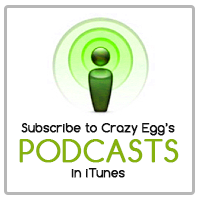 Subscribe to the Crazy Egg podcast!